The final round is here! Final results are announced, and we congratulate the defending champion - Gennady Korotkevich (tourist)! Penalty time was crucial to identify the winner, even with the all-blind strategy for both tourist and hos.lyric 24 penalty minutes made the difference. Kazuhiro Hosaka (hos.lyric) placed second, Qinshi Wang (s-quark) finished third and was one of two participants to solve problem A. Live commentary is available on codeforces, photographs are here. Full and small final round materials are available. Congratulations to the top 25 participants of the stage, they are invited to the final round! Top 150 participants will receive a souvenire - double check your mailing address on the registrartion page. Short and full round archives are available on the links. Today, on June 15 at 1 p.m. MSK the last round of Yandex.Algorithm elimination stage will begin. Crucial for determination of Yandex.Algorithm finalists 718 score points will be distributed during these 100 minutes. 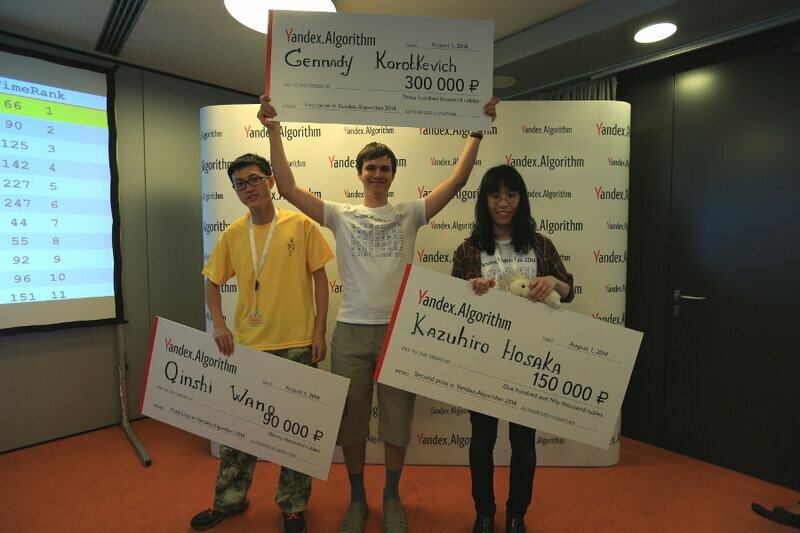 Three prize-winners of Yandex.Algorithm 2013 have already reserved a place in the final round. Have you? The round is available on the link. Official results of the round 2 and cumulative results of the elimination stage are published. Full and short archives of the round are available for a download. Elimination stage of Yandex.Algorithm 2014 will start at 9 p.m. MSK. It is available to all qualified to the elimination stage participants on the link. Round will last 100 minues, its top 30 participants will earn score points based on Gran-Prix 30 system.